Earlier this week we went to Testarossa Winery in the hills above Silicon Valley for a celebratory sales dinner. As our bus winded up the mountain road, we were greeted by a sign to welcome us and another group who apparently also had an event at the winery that night. OK, we were the smaller of the two companies having events at the winery that night, but we found the sign a really interesting because it offered a clear choice. Feeling Lucky? Or do you need Actionable Data? You can certainly find lots of interesting historical information by Googling stuff online but you won’t find actionable data about the condition of your products that enables you to make informed decisions to improve your supply chain. (Try Googling “Are my berries fresh?” and you’ll see my point.) Fortunately, with Intelleflex condition monitoring readers and tags and our ZEST Data Services, you can now collect, aggregate and securely share that information about the condition of your fresh produce or temperature sensitive pharmaceuticals on-demand. 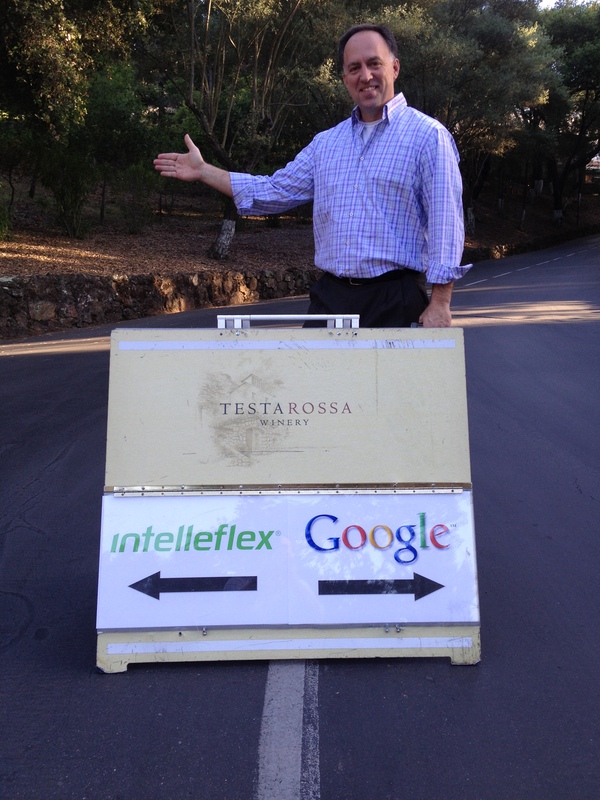 The choice on the right in the photo still offers value because you can learn more about Actionable Data by Googling Intelleflex! Dinner was great by the way and our thanks to Testarossa.